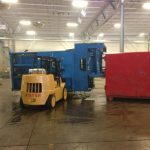 Heritage Industrial Services, Inc. was recently hired to perform the dismantlement, rigging and removal of various pieces of equipment from a former manufacturing facility located in New Jersey. The client selected Heritage based on their safety record, detailed proposal and their cost estimate which was within the clients budget. Prior to work beginning all utilities were de-energized, isolated and capped by owner. There was a project meeting on site to discuss overall project safety and the means and methods for the work being performed. JSAs and other safety documentation was also completed. The equipment consisted of industrial pallet equipment, steel platforms and multiple conveyors throughout the facility. Heritage utilized hot work means and methods during the steel removal, various rigging, forklifts and other tools to complete the work. 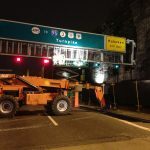 During the project, select pieces of equipment were saved and shipped to other facilities for reuse including miscellaneous steel tanks, dumper systems, incline conveyors and other associated equipment. 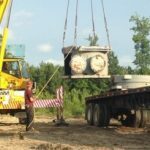 Heritage Industrial Services is a family-owned specialized industrial rigging, dismantling, and millwright contractor company based in New Jersey and operating thru-out the United States. Safety is a priority on every project as well as quality control and adherence to all specifications and budgetary goals. We have worked on projects, both demanding in time and technicality, and always finished safely and on schedule. We at Heritage Industrial Services pride ourselves on job performance and meeting all of our client’s needs.